Aquaphor Smile is the ultra compact space-saving, lightweight and mobile device to use every time you want to have a glass of clean water. It fits inside of your refrigerator door, providing additional space for your cooking activities when your kitchen is small. Despite its small size, the purification performance of Smile water jug is astonishing, provided by the new Aquaphor A5 filter. More filtration media, combined with a special pre-filter cap on top, gives A5 a longer lifespan – up to 350 L in turbid water. A5 also enriches water with magnesium for health benefits and better taste. Once prepared for use in accordance with the owners’ manual, the filter jug purifies water poured into the funnel by running it through the filter under the force of gravity. 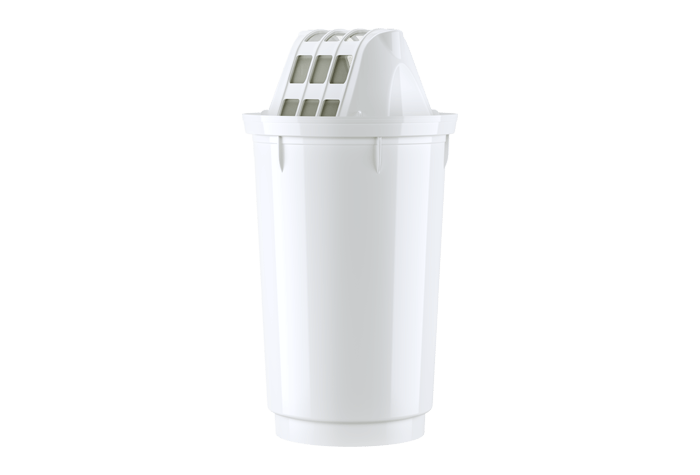 The filter cartridge irreversibly traps contaminants or excessive minerals in water, combining various filtration methods. Water minerals: reduces excessive hardness. Extra: efficient in colloidal iron and dirt retention due to its micropore cap, provides natural mineralization with magnesium. *This product is aimed at tap water purification. It is not recommended to use B15 for microbiologically unsafe water. **Reduced contaminants may not be present in all users’ water. Prior to the first usage, hand-wash the jug, the funnel and the lid with a mild detergent. Place the funnel inside the jug. Soak the filter in water for 10 minutes and install it into the funnel. Check that the filter sits firmly in its socket. Fix the lid on top of the jug. Fill the funnel with tap water, let it run through the filter and then discard (repeat this step two times). Your Smile jug is ready to filter! The impeccable quality of AQUAPHOR products is backed by the leading international certification bodies. Reduces the annoying chlorine taste and odour from tap water, and filters out sediment and other visible contaminants for clearer, brighter water. Purifies 6 to 8 glasses at a time, reducing common and more intricate contaminants so that no drop is left unattended. Filter jugs are as intuitive and simple as they get; just fill with tap water and let it run through the filter cartridge. The jug comes ready to use and replacing the filter takes just a few minutes. Filter jugs are made of safe BPA-free materials. Whilst using this system instead of bottled water reduces plastic waste, the jug and filter cartridges should be recycled when worn-out.